Please note: A expanded version of this story appears in our book Haunted Marion, Ohio. For anyone digging up stories about Marion’s spookier side, the Merchant grave is the natural starting point. In fact, it would be hard to find anyone in Marion who hasn’t at least heard of the grave and its mysterious revolving ball. Ripley himself deemed it interesting enough to include in his newspaper column in 1929. Personally, I remember hearing about the ball as a kid and picturing a huge glowing ball suspended in the shimmering air, it’s rotation slow and deliberate. In 1886 the Merchant family of Marion constructed what they thought would be a beautiful and fitting grave monument for their family burial plot in Marion Cemetery. Within two years after its construction, someone noticed that the 5,200 pound polished granite ball atop the pedestal had begun to rotate. The only unpolished spot on the ball was now visible, indicating the ball was on the move. The Merchant family, being concerned about this, brought the erection crew back to the site to re-set the ball. It was not long before the ball again began its now continuous movement. Various explanations have been proposed for the ball’s movement: the Coriolis effect, the seasonal expansion and contraction of the ball, seismic activity. However, since it’s a grave, there are also those who suspect some otherworldly explanation. Still, there is no record of any gruesome or even untoward stories about the Merchant family that would suggest that their grave should be haunted. The real reason behind the ball’s movement remains a mystery. Seth had already been to the Merchant ball, but this was my first time seeing it. (I had unsuccessfully tried to find the ball once before. However, I was only able to find some other huge ball that, apparently, doesn’t move.) I stood dumbly in front of it, maybe hoping to see some slight movement, while Seth snapped a few pictures. However, according to the book Weird Ohio by Loren Coleman, Andy Henderson and James Willis, the ball only averages two inches of movement per year which means, literally, I would be better off watching grass grow. 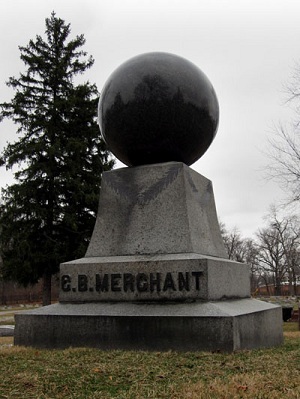 In Bucyrus, there are 3-4 more small “merchant” balls, that have the same bald spot on them. We noticed with each of them that there was a small gap between the ball and the pillar itself. There was water in them and if you pushed them lightly, the ball would move revealing the bald spot even more. Is this the answer to this question? I have no idea, but its an interesting theory. I’ve seen the Merchant Ball, and it does move. Polly Walker it surely does move. My father told me when he was younger he used to always move the ball back to where it once sat, and when he would go back, it would be on the other side. It is by my uncle’s grave and I saw the spot where it once sat. So it does move. Someone left a message about the pics I took of the orbs covering the ball. I just got copies made. Pics taken with a 110 and no Photoshop!! !